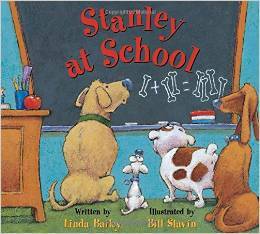 Stanley at School is a great book! If you’re not a dog lover, I promise you’ll still love it. Stanley and his buddies watch their kids go off to school each day. One day their curiosity about the mysterious school, prompts them to action. Rushing through school, the group finds trouble and answers to their questions about the school day but not before they find themselves in the principal’s office. It’s a great story for kids who might wonder if their pets think about them during the day. I loved it and would highly recommend it.